Published March 5, 2019 By Anna T. This post may contain affiliate links. Regardless, I only recommend sites I've researched and/or used and trust. You can sign up for Ibotta here or read my Ibotta review here. 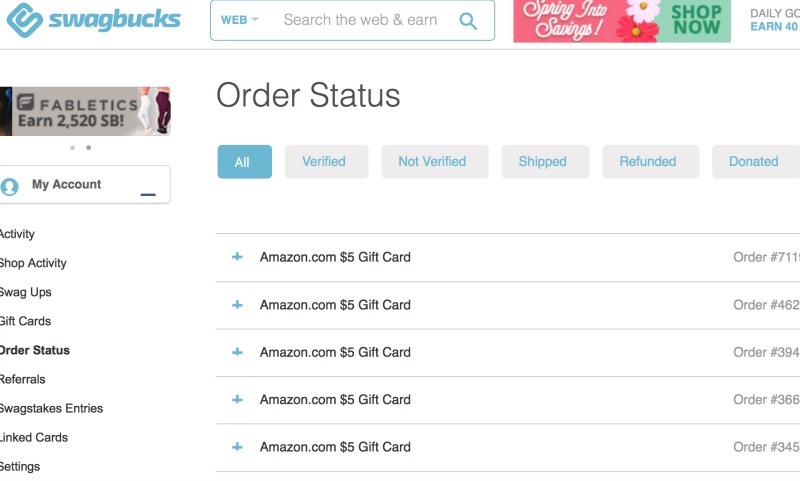 You can read my review of Swagbucks here or sign up here. Check out this list of some of my redemptions below. I usually opt for Amazon over Paypal. Go here to sign up or learn more about how to join Pinecone Research. Slice the Pie is a site I've used frequently. All you do is listen to music and rate/review it. You'll get paid anywhere from six to seven cents up to sometimes seventeen cents per song you review just depending on if they have any promos going on. It only takes a few minutes to review a song. They pay out on Tuesdays and Fridays and you must have a minimum of $10 to withdraw your earnings, but this is very possible to do twice per week. You can sign up for Slice the Pie here or read my Slice the Pie review. I have not yet reviewed InstaGC, but Work at Home No Scams has a very detailed review of how it works here. 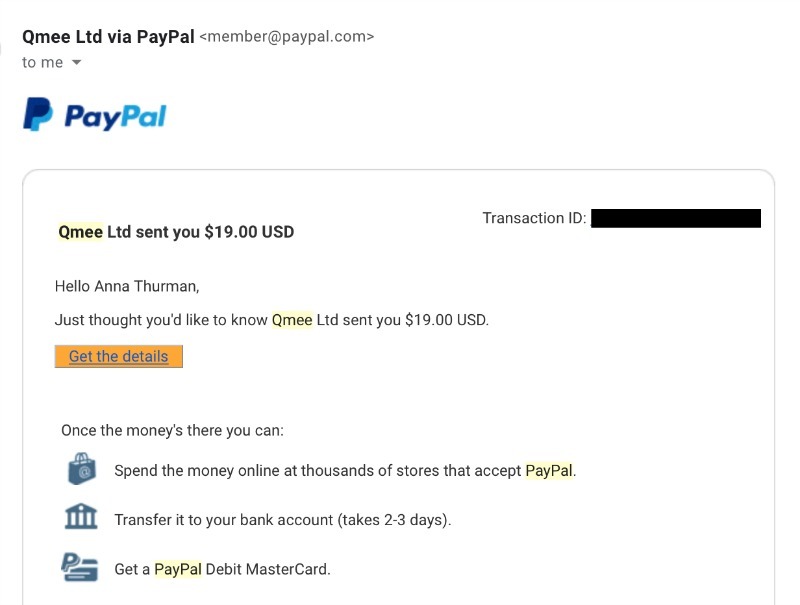 Go here to sign up for Qmee or read my Qmee review. Then, within a few days, you'll start seeing daily deposits from MTurk to your bank account. Is it easy to make $10 a day on Amazon MTurk? It actually is. I don't use this site anymore, but you can see below that I was able to generate almost $500 in extra income using it off and on for a few years. And many people earn much more than that using it daily. 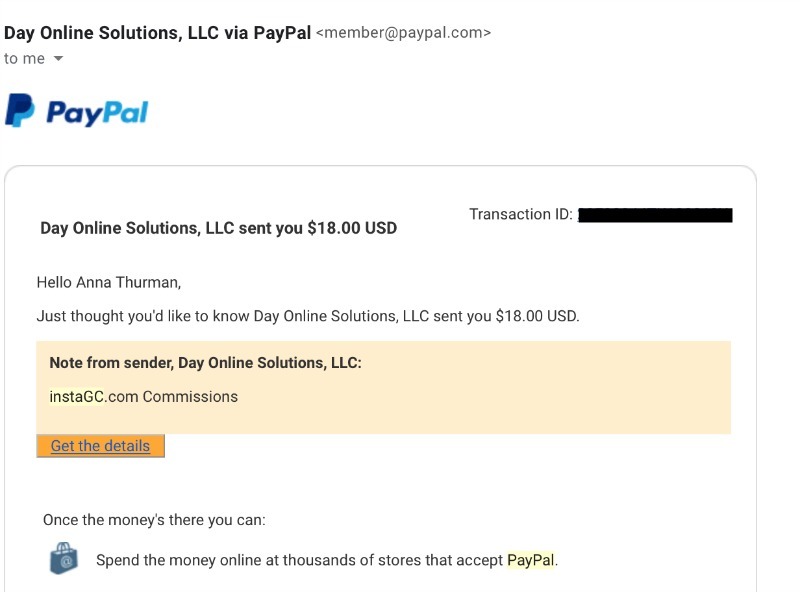 I don't have any payment proof for this site because I've never done enough work here to get paid, but they are legit and do pay according to many of Real Ways to Earn's readers. Read my review of Transcribe Me or sign up here. Good luck to you if you decide to sign up and try any of these! Post originally published April 30, 2012. Updated and republished on March 5, 2019. No matter where I try to click on the Pinecone sign up link, the page opens then automatically closes. I’m in the US so I”m not sure what’s going on. How did you pass the test in Transcribe Me? I’m on my third attempt now. Frustratingly, I failed my first 2 trials. Please help. 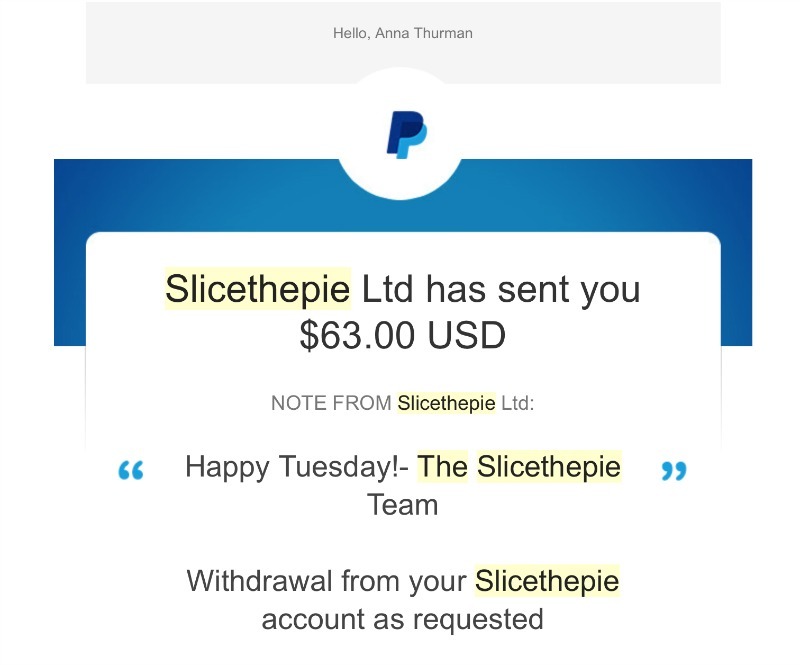 With Slice the Pie I think it’s important to note two things: 1.) 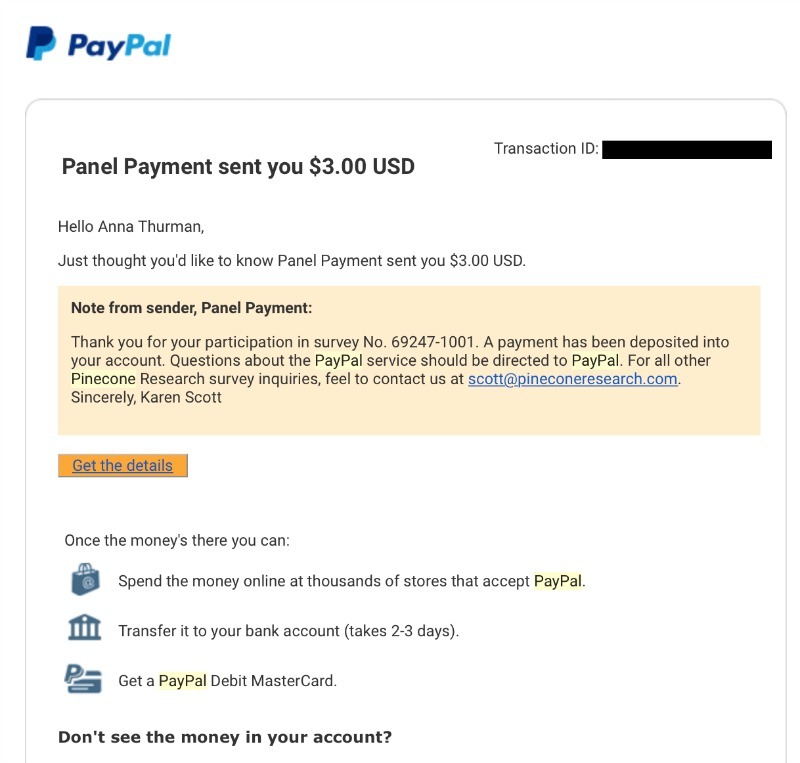 You have to have a balance of $10 minimum to withdraw to your PayPal account, and 2.) 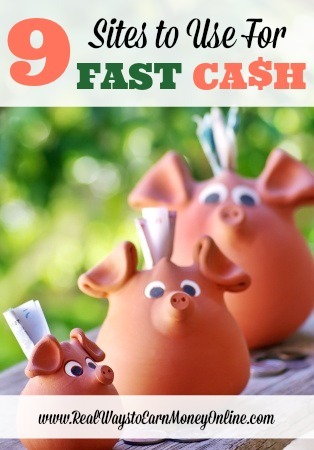 It can sometimes take 5-6 days for them to release the money to your account. This is usually done on Tuesdays and Thursdays. Yes, you’re right. I’ll add it to the post above. But the reason it’s listed is because they do pay more than once per week and many people are able to reach cash out on both days. It’s ALWAYS good to get a little extra cash coming in, esp. around the holidays. Thanks so much for the list! I prefer SavingsStar to Ibotta, only because of what we have for stores where I live. They pay very quickly once you hit $5. Just wanted to put that out there. Yes, Saving Star is excellent! I should probably add them to the list. Ibotta has made a lot of changes lately though and I think they have added way more stores than they had to start. Have you check it lately to see if they added anything local to you? Thanks! I just downloaded Ibotta again, and there are some new stores added. I’m excited about Costco! Pincecone seems to have switched to paying in points and not cash. At least, that’s been the case for me. I used to get $3 per survey, but then they sent out an e-mail about a point system, which I didn’t totally read, and now every survey has been paid in points when can be collected and redeemed for cash, gift cards, or other items. You are correct, I heard about that, too. I think you can still get the $3 per survey though if you redeem the points for the cash.